In the hilly geography of north Georgia, retaining walls are often built to hold back earth. We’ve assisted with installing retaining walls that help make a backyard more functional with terraced levels. Part of the fun at Hutcheson Horticultural Company involves not only designing and installing a retaining wall to increase functionality of space, but also to be an eye catching design element in your yard. 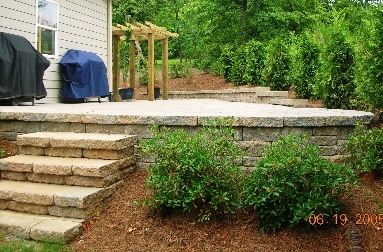 Retaining walls made out of stone or brick can help to level out a sloped backyard or sideyard. What was once a sloped area, or even a steep incline, can become a play area for children or a level area for entertaining and outdoor cooking. Retaining walls that are built with a dual purpose in mind are quite attractive and help add value to a home. This can even be accomplished by keeping the element of size in mind. We have seen north Georgia backyards with a nearly vertical retaining wall that limits the amount of outdoor space. However, when the time and space allow for a series of staggered retaining walls, the outcome can be quite different. Whether you are seeking to add functionality or design to your outdoor living area, the possibilities are endless with a variety of materials available. From stone veneered concrete block to strategically placed boulders, our design team can create a functional work of art just for you! Contact our Woodstock landscaping team at Hutcheson Horticultural Company for a consultation.